1. 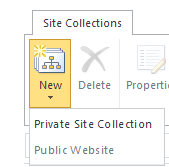 From the Admin Center, click the Admin drop-down arrow on the top right and then click SharePoint. 3. Next, complete the form by entering the site title, time zone, administrator, and storage quota. Enter a domain name that matches the internal site but with a -Web in front of Sharepoint.com. This is okay, as we will change the name later to the custom domain name. 4. It will take a few minutes for the site to finish building. Once complete, the URL will be displayed under the Website heading back on the Site Collections page. Check the administrators on the site by selecting the check box next to the URL of the public facing site. Click Owners and then click Manage Administrators in the top toolbar. 5. On the Manage Administrators page, set Primary Site Collection Administrator and Site Collection Administrator(s). There are no differences in the rights of the two, but the the Primary Site Collection Administrator is the only one that gets the email notifications about the site. So ensure the Primary Site Collection Administrator is the administrator that will handle the alerts on the site. Once complete, the public facing Web site is now set up and ready to begin customization.